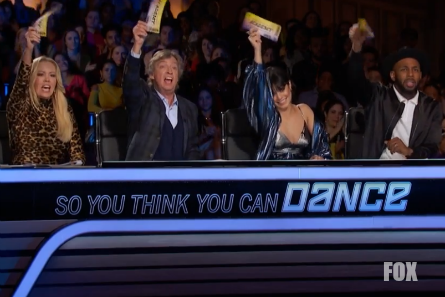 “So You Think You Can Dance” (SYTYCD) season 15 went from Los Angeles to New York auditions for episodes three and four. New York City being the capitol of Hip-Hop style dance, there were some exceptional dancers in that genre. 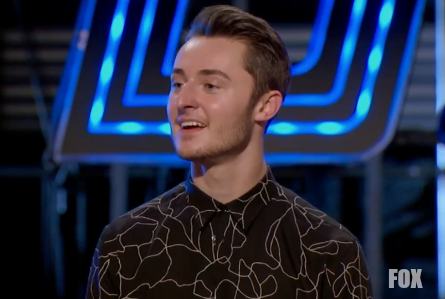 SYTYCD All-Star Twitch whose specialty is Hip-Hop, joined the panel of judges for this leg of the auditions journey that included Mary Murphy, Nigel Lythgoe, and Vanessa Hudgens as he did for the Los Angeles auditions as well. The dancers were competiting for a chance to move on to the next round which is NOT cherography this time, but straight to The Academy where they will have to prove that they are talented enough for the live shows. The stakes are higher which also means Nigel and his panel of judges set a higher precedence on the skilled dancers auditioning in front of them. Emily is 18 years old from Springfield, N.J. She’s been dancing for 16 years. Her sister, who was at her audition in support, got her into dance. Nigel told her “that’s what I call setting a standard” and told her she’s “magnificient.” Vanessa said it was so beautiful and her control is crazy and she showed passion and skill. Twitch commented that one of her moves was like she traded-in her bottom set of ribs for another set of abs. Mary said her smile lights-up the stage, and she turned around and “became a beast!” Emily got a ticket to the Academy. Gabriel is 28 years old from the Dominican Republic. His audition was of him manuvering his body with a large hoop. It seemed more like an “America’s Got Talent” audition than one suitable for SYTYCD. Twitch said he wanted to see more of him “getting down on his own.” Nigel noted that there was nothing signature in his moves. Twitch disagreed that he was “dope!” Mary said he needs to be smarter on how he auditions because they needed to see dancing. Gabriel did not advance. But, he was super-excited to have the audition. He auditioned last year and made it to the Green Mile and was told “no.” He said it’s tougher this year because he has to prove that he’s grown. Twitch remembered Evan and was impressed. He told him he didn’t come back on stage “defeated” he came back knowing that he belongs somewhere. Mary said she thinks it’s going to be his year! Nigel reminded him that he lost-out to the eventual winner, Lex, last year. He said Evan is still tremendous. He got a ticket to The Academy. Rachael is 19-years-old from Albany, NY. Vanessa was getting 80s, Flash Dance vibes from Rachael’s audition. Twitch told her she has more work she needs to do and more maturity to be gained. He said “no.” Mary ncalled her a diamond in the rough and wanted to see her go on. Nigel had the deciding vote which was “yes” that she go to the Academy. His audition got a standing ovation from the judges. Twitch reacted “so dope” and said Kyle’s confidence really read and his “tutt” angles are really crazy (as in great). Mary said she hasn’t seen tutting like that and he was so good that she couldn’t capture it all. Nigel said people don’t realize how much work went into that and said he could be “a star this season” if he’s that good in other styles. Vanessa said her heart was pounding out of her chest a little bit. Kyle got a ticket. Victoria is 18-years-old from Dade City, Florida. She’s a Contemporary dancer and said dance is everything to her. Vanessa loved her audition. Twitch said she did a great job using the length of her body. Mary said “gorgeous” and the Choreographers would love to work with her. It was “an amazing audition.” Nigel said her contemporary was based on gymnastics rather than ballet and he wants to see the dance parts first. He gave her a ticket. Elan and Jordynn are brother and sister Salsa dancers from Florida. Their mom, Dana, is a salsa dancer who taught them. 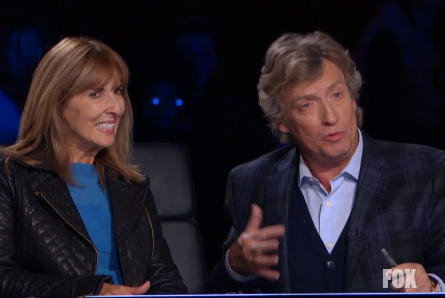 She was at their SYTYCD audition and was invited to join the judges panel for their. Mary was impressed and told them “fabulous tricks.” Nigel wanted to see Jordynn smile more. Vanessa loved Jordynn’s spins! Mom joked that she’s seen better, than said they were phenomenal. Twitch was amazed and thought it was dangerous. He said he likes that they’ve got that “family fire!” They got tickets to the Academy. It was the last day of the auditions in New York, the birth place of Hip Hop. The judges were impressed by a slew of talented dancers from all styles. Andrew & Melany are Ballroom dancers from Bronx, N.Y. Their audition was flawless and the judges gave them a standing ovation. Nigel called it “tremendous.” Nigel also mentioned that he loved the “street style” of it. Melany responded that, that’s what they want to bring to the show. Vanessa called it “dynamic.” Twitch said he caught himself “comfortably shimming.” Mary admitted that she couldn’t keep her eyes off Melany and Andrew showcased her well. Mary put Melany on the Hot Tamale train! They got their Academy tickets. Randorn, who’s 27, is from East Hartfort, CT and is a Hip-Hop dancer. He was part of a program called break-dancing Shakespeare. He currently teaches in schools, connecting dance with Mathmatics and Science. Twitch told him his footwork is clean. Mary agreed that he was clean and energized. Nigel said they get so many B-Boys with a handful of moves, but Tiger didn’t run out of moves. Vanessa said he never disengaged. But, for the show, he needs to know how to do a lot. Nigel said “no” because he was worried about the other styles. The other judges said “yes” and he got a ticket to the Academy. Mika is 18 years old from West Linn, Oregon. She’s a contemporary dancer who overcame a rare cerebral illness. Dance helped her to cope with it. Mika picked a spoken word piece that was anti cyber bulling. The judges didn’t react well to the music choice. Twitch reacted that the solo itself was NOT his favorite. But, sees her potential. Mary said it didn’t get across to her, but sees her strength and elegance. “It was beautiful to watch,” Mary said. Nigel asked if Mika was very sick at one point. Mika explained how she overcame her sickness. Nigel told her that the emotion that she’s expressing, she needs to convey it in her dancing. Vanessa said it was an interesting choice in music, and would like to see Mika connect more. Vanessa said “no”. Twitch and Mary said “yes.” Nigel had the deciding vote. He said he didn’t have the heart to say “no”. So, it was a “yes” to the Academy. Kory is 27-years-old from Yardley, PA. He’s a jazz dancer since eight years old and always danced in a “sophisticated, show-ready way.” Broadway inspires him, Kory said. Kory’s audition was very show-tuney and entertaining for the judges. 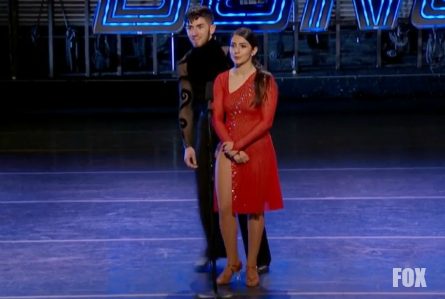 Nigel put a damper on Kory’s spirit when he reacted to his audition saying it was “everything that Broadway isn’t.” Nigel called it “over the top.” Vanessa threw-in some positivity by saying he had a lot of strong things like his jumps and legs. Twitch said he felt like he was watching Bob Fosse’s wife if she was just walking. Mary advised him to keep developing his technique. Brianna is 18-years-old from Seattle, WA. She’s a tap dancer who said tap is tied to ballet dancing. Nigel led a standing ovation for her at the end of her audition. He said Jazz Tap is not easy to do and she found really cool nuances. Twich said he loved the pocket and seemd very on top of what she was doing. Vanessa loved her fluidity and showed her range as a dancer. Mary said Brianna showed all levels and ALL layers. She got a ticket to The Academy with all “yes” votes from the judges. Arcadian is 22-years-old from Florida. He’s a professional ballet dancer who started dancing a bunch of different styles until he was 14 when he attended Orlando Ballet. He became the youngest hired ballet dancer at age 16 after working really hard at getting better at ballet. Nigel called him “tremendous”, remarkable moves. Nigel advised him to get a little bit more personality out of what he’s doing, more uplifting. Vanessa said it’s impressive to see a male ballet dancer command the stage. She thought he was strong. Twitch said it was a great display of power nd grace. Mary loved it and called him “fantastic” with “ah ha” moments. Of course Arcadian went through to the Acdemy. Others who went through included: Darius Hickman, who Mary called “spectacular” with his silent landings; Jensen Arnold – who auditioned last season and was cut. Her sister is Lindsey Arnold from “Dancing with the Stars”; Genessy Castillo – Vanessa said the shapes that she creates are so powerful and beautiful. Unique talent in New York came from Bridget Derville-teer. She’s 18-years-old from Portland, Oregon. Bridget said she likes to dance intense and dark. She tried to conform what other dancers are like. She fell into a depression and eating disorder. Her treatment center didn’t want her to dance again. Bridget said she got better once she got back to dance because she wanted to be healthy. Mary called her a “power-house” and said she showed them a dark piece today. Nigel said he’s going to have nightmares in a good way. He said she was like something out of a Japanese horror movie. She acheived in giving out what she was going for. Vanessa called her ‘explosvie” and “mystical,” she embraced her darkness. Twitch told her “excellent job.” She got a ticket to the Academy. Ryan, 24, was the last dancer to audition in New York. He auditioned in season 12 and made it to Vegas week and got cut during Hip-Hip round. He’s doing “visual intoxication” which is a style he created. 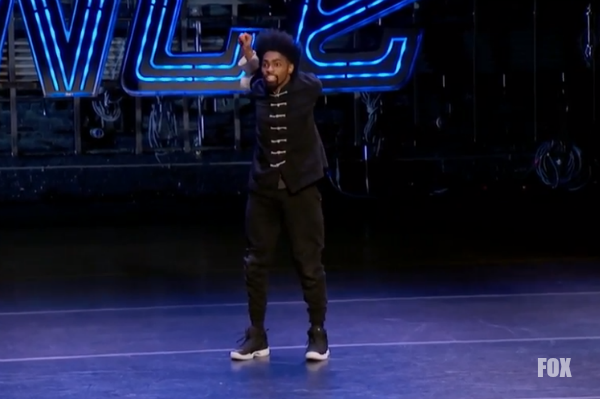 He literally went from dancing on trains after moving to Brooklyn to auditioniing on SYTYCD. 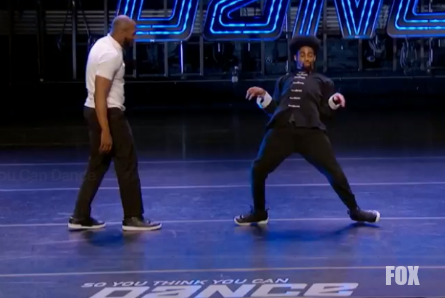 Nigel called Ryan “sick in so many ways” and “that was like watching ‘the Walking Dead’ come to ‘So You Think You Can Dance’.” Twitch said he remembers Ryan from Season 12, but he’s on a different level now. Mary called him a “genius artist.” Vanessa asked if he was looking at her. He said “yes” he was her biggest fan from “High School Musical.” Vanessa said she’s his biggest fan! Nigel asked if he does battle. He said yes! Nigel was asking for Twitch who got up and Hip-Hop battled Ryan.